I make daal (lentil soup) and rice pretty regularly but it never occurred to share this recipe here because it’s so simple. I made a similar recipe on my insta-story using bok choy and got a ton of interest and recipe request so here you go friends, a full recipe with few notes and video. One of the reasons I love this recipe and make it so often is the fact that it’s simple, nourishing, and I can make daal + greens like spinach, bok choy, or mustard greens along with rice at once using my instant pot. As a food blogger and recipe developer, I am always thinking about new and exciting recipes to share but I find a different sense of joy in sharing my go-to recipes because they are practical, nourishing, and hopefully will simplify your life. Instant Pot Moong Daal with Spinach + Rice is a flexible recipe that can adapted per your needs and I have jotted down few notes along the way. The video I am sharing has Instant Pot Moong Daal with Spinach + Rice with a option to skip the rice if you prefer. Instead of basmati rice, you can substitute with different grain, brown rice, or quinoa but please note that your ratio of water and cooking time will vary. Dried lentils are a staple in my pantry, esp moong daal and masoor daal as they cook relatively quick Depending on the type of daal, cooking time varies anywhere from 10-30 minutes in a pressure cooker or instant pot. If you don’t own either of the appliances, stove top or slow cooker method works too, it just takes longer. Pre-soaking lentils and beans also reduces the cooking time. Instant Pot Moong Daal with Spinach recipe I am sharing today is in it’s simplest form but feel free to jazz things up with more spices, add minced ginger, tomatoes, onions etc. 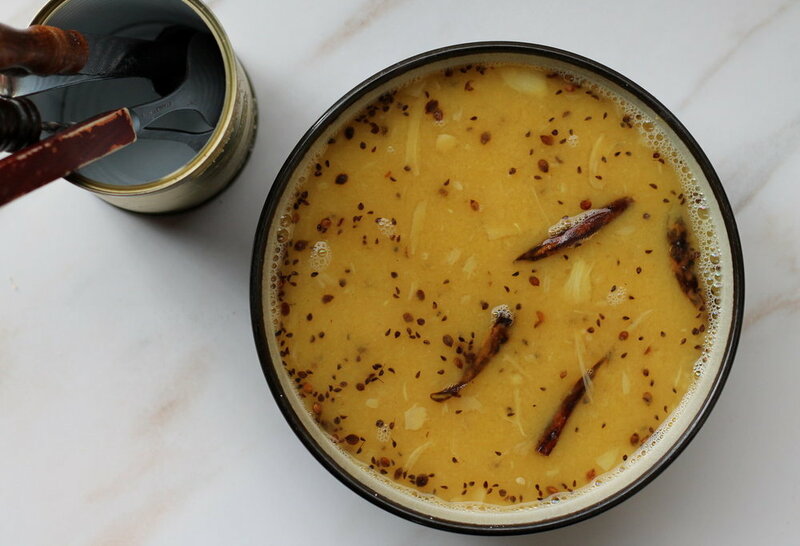 Typically daal is finished off with tadka/chaunk but on a weeknight, I usually skip the process although it does add a lovely flavor to the dish. Tempering (tadka,chaunk) is a technique in which whole or ground spices, garlic, curry leaves etc are briefly roasted in oil or ghee in order to release their essential oils, thus making their flavor more aromatic. Start the instant pot in saute function and add 1 tablespoon neutral oil. Add 2 teaspoon cumin seeds and fry for about 2 minutes until it turns brown and fragrant. Add 4 garlic cloves sliced into the pot and let it brown a little. Mix in 6 oz. frozen spinach and cook it down for few minutes, then add 2 teaspoon turmeric powder and salt. Continue stirring the pot and add 1 cup moon dal along with 4 cups of water. If not cooking the rice, close the lid and seal the instant pot. Change the instant pot setting to manual for 4 minutes, then allow it to naturally release the pressure. Taste and adjust the salt per your taste. If cooking the rice, set the stand (trivet) inside the pot with it’s leg facing down. Carefully transfer the glass container with 1 cup basmati rice and 2 cups of water on top of the trivet. Close the lid and seal the instant pot and change the instant pot setting to rice ~ 10 minutes. Let it naturally release the pressure, which should take about 15 minutes. Open the lid when all the pressure has been released. Set the trivet on top of a board. Stir the daal & taste the seasoning as needed. ** Depending on the size of your instant pot and the glass container for rice, you may need to use less rice to prevent overflowing of cooked rice. Sometimes you may also notice a slight yellow color on rice, which happens if you cook a large volume of daal.